After a couple of weeks of idols, I’m back on the Serious Anime Writing train with my analysis of the Bishamon Arc of Noragami Aragoto. The nature of Noragami‘s gods and the way they interface with the humans in the show has always been the most fascinating element of Noragami for me, so being able to find the material to write this article was quite a pleasure. This arc articulated a bunch of things I’d kind of half-said about the first season of the show, and as it happens having the second half of the show around to finish articulating what Yukine arc started helped a lot in that regard. So what, if anything, does this arc mean for those of us watching it? For those not particularly religiously inclined, all this may be somewhat interesting intellectually, but fail to seem relevant to their lives. For the Regalias, this is a dynamic that is unavoidably part of their lives—Noragami‘s gods are intensely real to them and sustain their very existences. But depending on the religious beliefs you subscribe to (or not), this complex relationship may or may not be a part of your life. I actually once started a post on this very topic, drawing from the first season of Noragami—it was titled “The Inconvenience of the Gods” or something along those lines. The intent there was to point out how oddly inconvenient it is to even maintain a belief in a god, as illustrated by the difficulties Hiryori has with plumbing the depths of Yato’s seemingly schizophrenic personality. Why even believe in a god like that? And this is where that other post started to fall apart, but hey! At least you got some bonus content, amirite? Ahh, short and sweet. I was thinking along similar lines but as much as I loved Bishamon’s arc, I find it difficult to give her much sympathy. 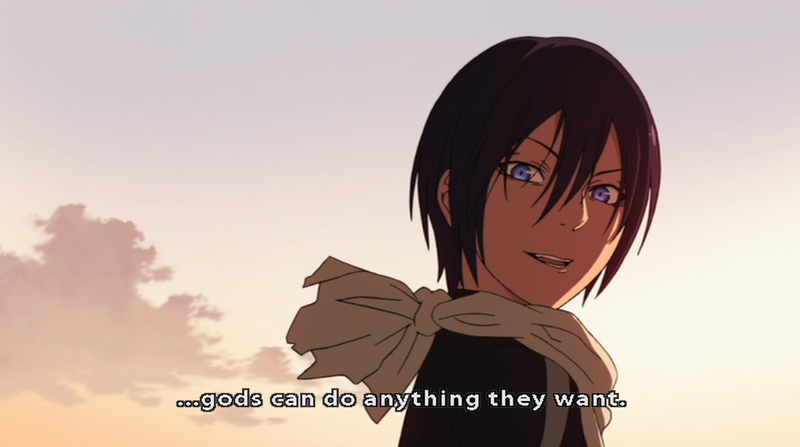 Yato claims that “gods can do no wrong” but it’s clear that gods in Noragami-verse are neither omnipresent or omnipotent and are actually rather flawed…they remind me of the Greek gods who were frighteningly godlike in power but human in temperament (a deadly combination). I suppose the answer as borne out of this interpretation I’ve advanced would be something along the lines of: “is there any point in giving a god sympathy?” They do not need it, because they’re gods. However, you make a great point about the flawed nature of the gods. I guess the really complex thing there, then becomes the question of whether or not gods can really be “flawed” at all—is there a standard that you can hold a god accountable to? The annoying chirpy manga readers are already chiming in about the next arc and how it might relate to this interpretation, so it seems that Noragami might have yet more to say on this topic. 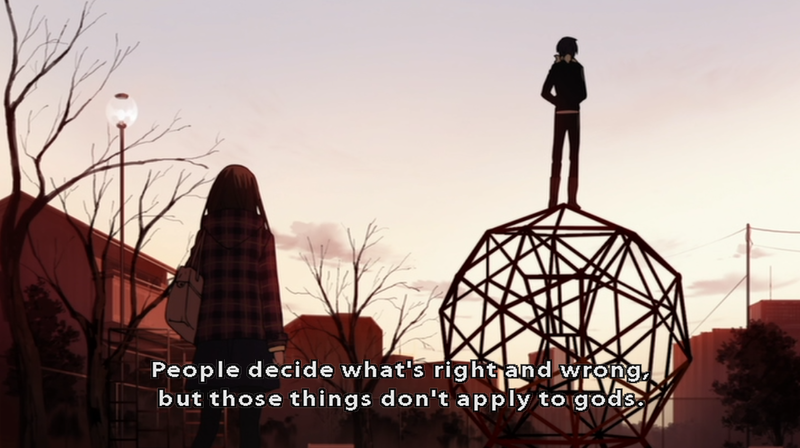 I’m having problems with Yato’s “Gods can do no wrong,” not on a true/false continuum, but by what it means. Yato always takes five yen as recompensation, and in the latest episode he felt that he should help defeat that phantom, because it’s a “masked one” (sounded like he felt responsible to me). All these are point towards a moral code. It gets only more complicated when we take into account that he made two promises to Tenjin – what’s the point of promises if Gods can do no wrong? If a god can do anything s/he likes, then breaking it is no big deal. and b) Yato’s promise to Tenjin. I’m not sure we’ll get it in this season, though; manga adaptions are troublesome this way. The intent there was to point out how oddly inconvenient it is to even maintain a belief in a god, as illustrated by the difficulties Hiryori has with plumbing the depths of Yato’s seemingly schizophrenic personality. Why even believe in a god like that? I’m not sure belief is all that important in Shinto. It’s more interacting with the God that matters; offerings at a shrine, etc. I’m no expert, but it seems to me the key component is an active emotional connection. Example: By taking your kids to departmentstore Santa you could keep kami Santa alive. Seen like that, what matters isn’t Hiyori believing in Yato in any supernatural way; it’s continuing to interact with him, and part of it is the contract between them. I’m curious: Did you watch any of the decidedly Shintoist anime, like Gingitsune, or Kamichu? As far as the masked Phantom this episode specifically goes, I believe the masks are associated with Nora (as you’ve said)—and there’s some kind of connection there that I think implies Yato considers those his responsibility to deal with, rather than indicating a specific moral compass he’s obligated to follow. A personally established duty, rather than a codified one, if you will. And you definitely have a good point vis-a-vis Shinto in this context. I’ll admit I was coopting Noragami a bit to touch on slightly more monotheistic ideas (I think there are some interesting parallels in the ways gods are treated and the ways their relationships play out between Noragami‘s version of Shinto and monotheistic religions), but I couldn’t quite make it work, which is why it ended up just as a few paragraphs here. And I have seen Gingitsune, which I adore. Haven’t seen Kamichu, though. …and there’s some kind of connection there that I think implies Yato considers those his responsibility to deal with, rather than indicating a specific moral compass he’s obligated to follow. A personally established duty, rather than a codified one, if you will. I agree with this. But what does that mean? It seemed to me Yato felt like he had to rectify this. Personal or not, it felt to me like he implied that he thinks he has “done wrong”, or at the very least that he is unhappy with the result of some of his actions. If not, where does the perceived responsibility come from? When we talk about gods not being able to do wrong, what are we talking about? We’re not talking about infallibility; I’m fairly sure about that. And I think that a perceived responsibility also rules out amoraility. But if it’s neither, then what are we talking about? Something like diplomatic (theistic) immunity? My best guess is that “a god can do no wrong” means a god is blight-free (i.e. a god’s own imbalance doesn’t cause blight), and that Yato is a bit self-serving in his interpretation of that fact. @Kamichu: Kamichu is interesting with respect to the differences between animism and monotheism. It starts out with the main character declaring to her friend that she has become a god, and that she’s not quite sure yet what kind of god. This attracts the attention of a class-mate miko, who declares herself a friend from now on, and would main character consider becoming a resident god at her shrine (the one they have currently seems a tad unreliable). It’s all very tongue cheek and unpretentious, but at the same time it feels actually pretty serious. I personally liked Gingitsune better, but this show dives head on into the animist aspects (there are kami everywhere; it’s just that most people can’t see them). It’s not that the gods transcend morality, it’s that they are amoral, and need humans to be their moral compass. 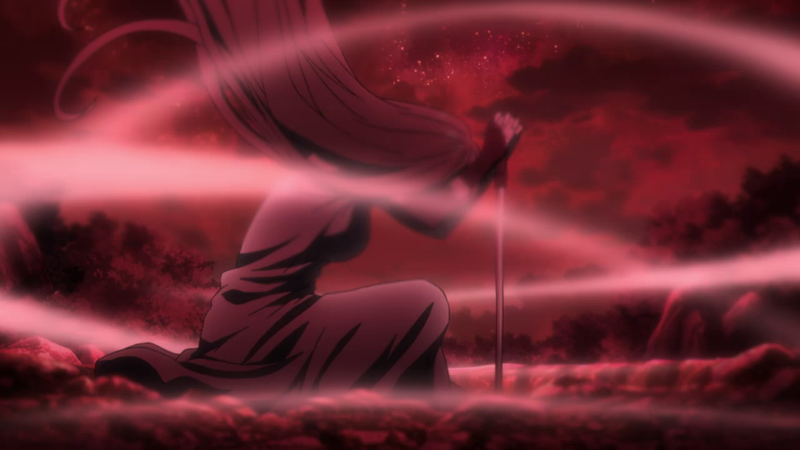 The gods use shinki as tools, or in the case of Bishamon, keep them as pets, even as they are the gods’ moral superiors. This is an interesting point—so I suppose you’d attribute Kazuma’s line, “Veena, you can do no wrong!” to his worship and love for her, rather than any concrete statement of her infallibility. I guess I’d shy away a bit from calling the Regalia the gods’ moral superiors, but with the latest episode (7) and Yukine’s continued development, this might be the way things are headed. I’m so glad you wrote this, thank you for having it on Aniwords too 🙂 There are certain shows with certain characters (Yato and now Bishamon in Noragami, Vash in Trigun, Hajime in Gatchaman, for instance) that I just can’t unsee as huge Christological types (in a necessarily limited capacity). And while your post doesn’t quite go that far I think (and nor probably the creators of the shows/characters), the similarities/differences between the god/regalia relationship and saviour/Christain relationship always leave me wondering: why do I get so attached to these stories when they are in anime? And I think it is because of the personal level of the attachment between the Christological type and those they save in these arcs. You really learn to love Yato, chore-skipping, promise-fulfillment-delaying, ratty-clothes-wearing guy that he is, as well as how much he cares for Yukine and Hiyori (same for you Vash and Hajime – if I get started on you Hajime I might never stop!). He chooses to spend his time with Hiyori and Yukine, who are not equal to him but are i desperate need of his help at times. It is beautiful how all three, mortal or immortal (Yukine, while not a god, isn’t a mortal anymore right, I actually would put him as more of an angel in a Christian equivalent?) can interact together and be face-to-face friends – and if that helps me appreciate my Christian/Catholic faith better, then I’m all for it 🙂 Sorry this is so long and not completely on topic, I hope that is okay!